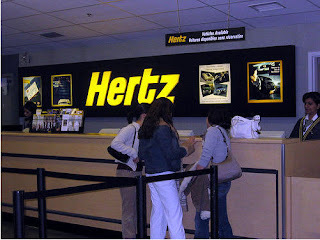 Over the summer of 2008, as the Attorney General's Offices in Maryland, New York and Boston were preparing to file charges against Hertz for gouging customers on refilling rental cars, they eleminated the practice, charging only the average gas rate for the area. Hertz had been charging customer up to $8 per gallon to refill rental cars returned without a full tank. The practice, along with the other various refilling options offered by rental car companies, net the industry great profits. The AG's office in several states found the practice abusive and threatened action against Hertz and several other companies for the practice. In order to avoid bad press and possible fines by states, Hertz changed its policy in June 2008, charging only average per gallon rate for the area the car was rented in. Well the press has cooled off and the AG's have backed off since the summer, so Hertz is reverting back to it's old practice of overcharging customers for gas. Hertz began sending out email's to customers this week explaining they were going back to the $8 per gallon charge. You may purchase a tank of gas from Hertz at time of rental and return the vehicle with as little gas as you prefer. Please be aware that we are unable to issue a refund for unused fuel. However, this method eliminates the need for you to refuel the tank prior to returning. You can let us refuel for you and only pay for the fuel required to replace the fuel you used, and for the service and convenience of refueling the tank. You can stop and refuel the tank yourself, immediately prior to returning the vehicle. We apologize for any inconveniences this change may cause. No matter which Hertz refueling option you decide is best for your travels, we are glad you are choosing Hertz. If you think Hertz charges allot for gas, don't get a flat tire in one of their rental cars. A woman was recently charged $499.98 for replacement of a flat tire on her compact rental car.